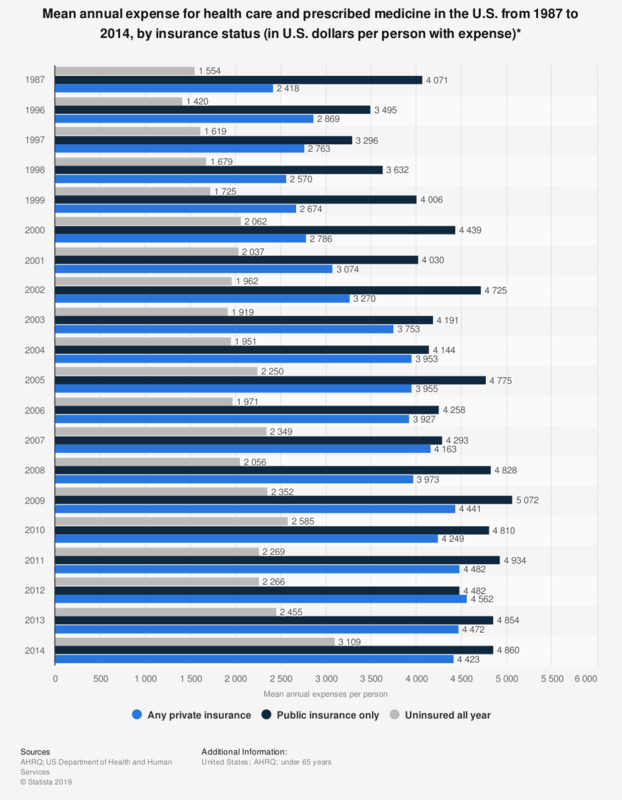 This statistic shows the mean annual expense for health care and prescribed medicine per person with expense in the U.S. from 1987 to 2014, by insurance status. In 2014, the mean annual expense per one all year uninsured person under 65 years came to over 3,000 U.S. dollars. Any private insurance includes individuals with insurance that provided coverage for hospital and physician care at any time during the year, other than Medicare, Medicaid, or other public coverage for hospital or physician services. Public insurance only includes individuals who were not covered by private insurance at any time during the year but were covered by Medicare, Medicaid, other public coverage for hospital or physician services, and/or CHAMPUS/CHAMPVA (TRICARE) at any point during the year. Uninsured includes persons not covered by either private or public insurance throughout the entire year or period of eligibility for the survey. Individuals with Indian Health Service coverage only are considered uninsured.